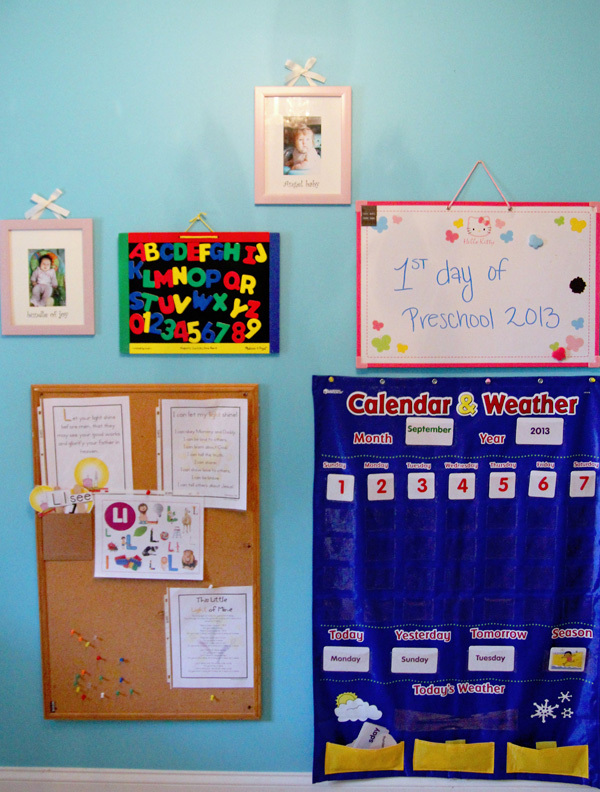 Our Play & School Room Reveal & Details - It's Gravy, Baby! 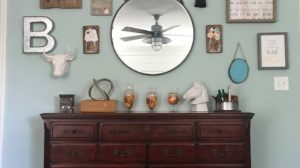 Last summer, I decided to create a playroom… then I broke my leg and ankle. So my plans were put on hold for one year until a spurt of second trimester energy hit and I found myself, screwdriver in hand, taking apart Bella’s crib. It was time to get this party started! Our house is what most would consider tiny, less than 1,110 square feet with three bedrooms. 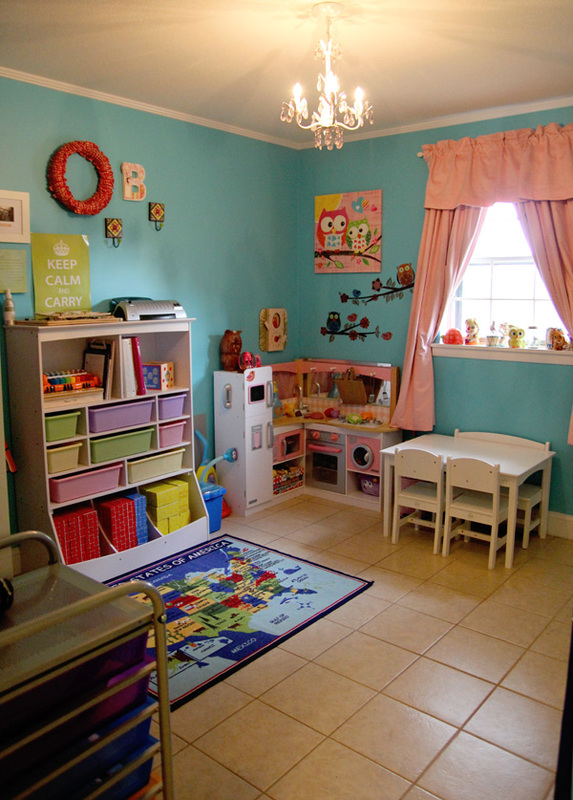 In order to have a play space and school room, the kids would have to sleep in the same room. That was my biggest concern, but constantly stepping over toys and storing school supplies all over the house just wasn’t working anymore. We needed a dedicated space. I needed a dedicated space with organization. So, I took the crib apart, shuffled furniture around (a perk of having tile floors- it’s easy! ), and at the end of the day- the play & school room was born. Next, I needed organization. Since the nearest IKEA is over 3 hours away, I found the best Expedit alternative- Closetmaid Cubicals. I seriously love these things and I know that they hold up well because I use them in Bryson’s room and our laundry room. I’ve ordered from Amazon.com and also found them at Lowes. Walmart carries Closetmaid too so you may find them there. 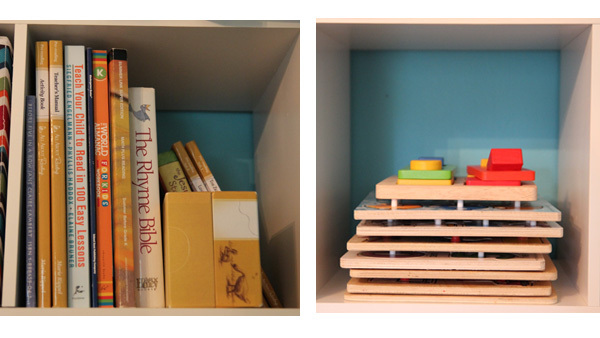 They work well in small spaces because they aren’t wide and that’s exactly what I needed for the school room. They also come with the hardware to anchor the units to the wall so you don’t have to worry about them tipping over. 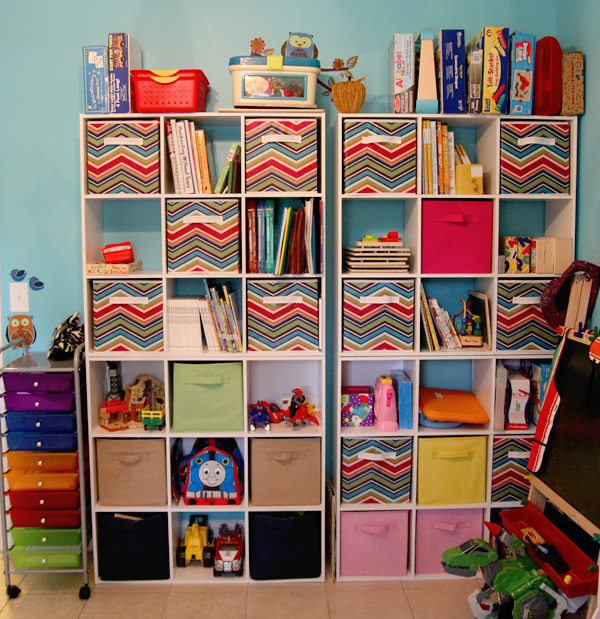 The only drawback is that they are not tall enough to store a 3 ring binder which is why I opted for the KidKraft Wall Storage Unit on the adjacent wall. We have different areas set up around the room. Over in the far corner, you can see the KidKraft Grand Gourmet Corner Kitchen. We bought this for Bella’s first Christmas and it has been a hit. They love that it has everything including a washing machine. Next to it, we have the KidKraft Nantucket Table Set which includes 2 chairs and a bench. This was a gift from my parents and again, we just love anything KidKraft. The quality is wonderful. This area is their little dining area where they often play restaurant and the table also doubles as their school desk. In this corner, we also have a child size broom, pretend vacuum, garbage can, and clock. Behind the door is another set of cubes from Target. This holds most of Bella’s toys. She is far too busy to actually play with anything and usually dumps everything in the floor and then moves on to the next thing. Justin is planning to build some shelves into the wall here because it’s such a small awkward space. How big is the room? This was originally Bella’s bedroom and it’s approximately 12×12. Is this everything? Yes, this is everything we use for play and learning. 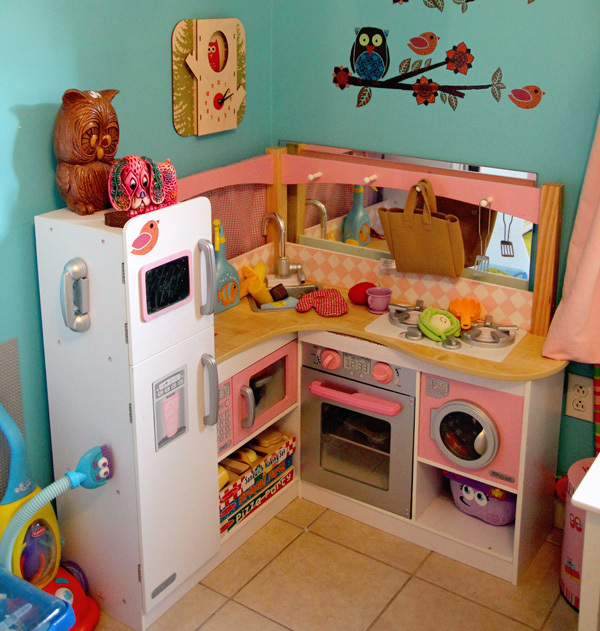 Bella keeps a few stuffed animals and dolls near her bed and there is a bookcase in their bedroom, but other than that- everything is in this room. They are allowed to bring toys out and play with wherever they like as long as they put those toys away when they are finished playing. They aren’t confined to the playroom and will often choose to play in other parts of the house, usually right under me, ha. How do you use the 10 drawer cart? Before we had a school room, it held our most used supplies, books, worksheets, etc. Now, I’m sorting Bryson’s work by day with 1 drawer for each day. So, all of his work for Monday is in one drawer as well as any supplies that will fit. I’ll also keep a list of extra things we’ll need that day to help myself stay on track. Anything I plan to use during the week that will fit inside a drawer is stored there. For instance, this week he has an “L” pattern block printable along with the Melissa & Doug Pattern Block Set in one drawer. I don’t have that much stuff! How do you do it? 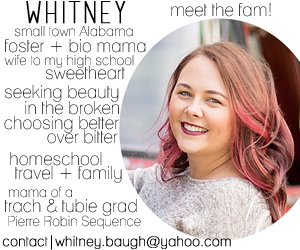 When I realized that God was leading us to homeschool, I started sneaking educational, learning, and play toys on Christmas and birthday lists. When someone asked me for a suggestion, I always had a running list of items we’d love to have for learning and play. The easel and the table/ chair set were both gifts from my parents. I try to be very intentional with Bryson and Bella’s Amazon.com wish list. (I have an Amazon wish list for everything, but more for personal use. I don’t share them with anyone other than immediate family.) I also found a lot of our stuff at thrift stores or places like Goodwill. That said, you don’t need everything that we have! We started with a set of dot markers, free printables, and wooden puzzles- that was it. Bryson loved those things! Where can I find/ what brand is it? Curtains: Lightcatcher Thermal Blackout Panels These are the BEST! We have 3 different brands of blackout curtains in our home and these work better than any I’ve tried. Did I miss something? 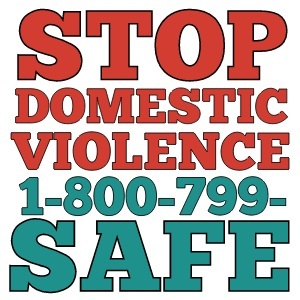 If you have questions about anything, feel free to ask in the comments and I’ll do my best to answer. This post contains affiliate links. Thank you for supporting It’s Gravy, Baby! 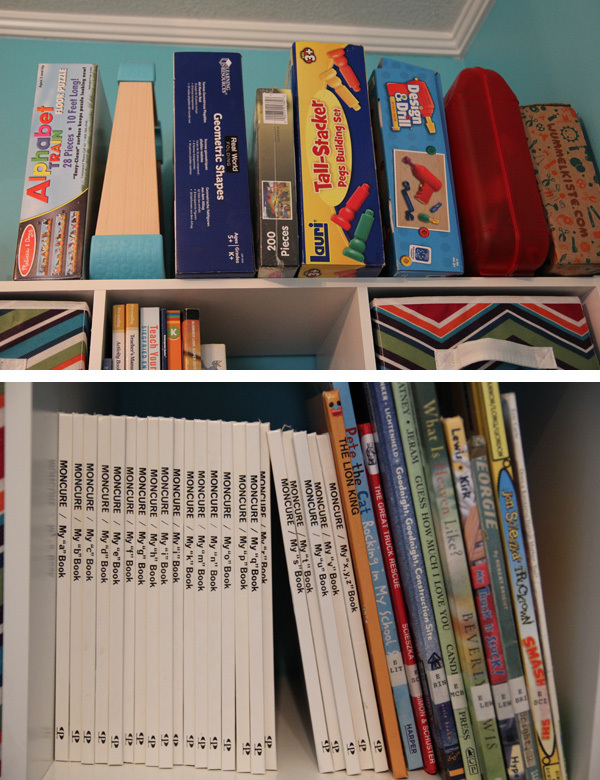 The KidKraft Wall Storage Unit was sent to us for review, but as you can see, we were huge KidKraft fans already. All thoughts and opinions remain my own, as always. I love it! It looks great in there. 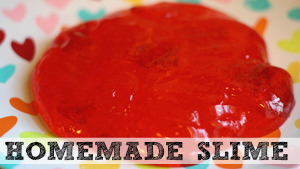 So much fun things for the kids to do! This room is adorable and looks very functional. I think you need to do Olivia’s closet next. LOL There are some great ideas in here that I will definitely be using in her room. Thanks! What a beautiful organized room. Any child would feel happy to be able to spend time there. Great job! It looks fabulous! 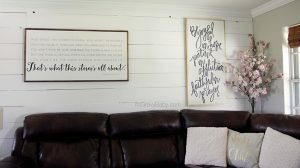 I bet your kiddos have a blast in this room! What a terrific room. Very well organized and tons of fun for the kiddos! OH my goodness! I love what you have done! Those owls are toooooo cute! 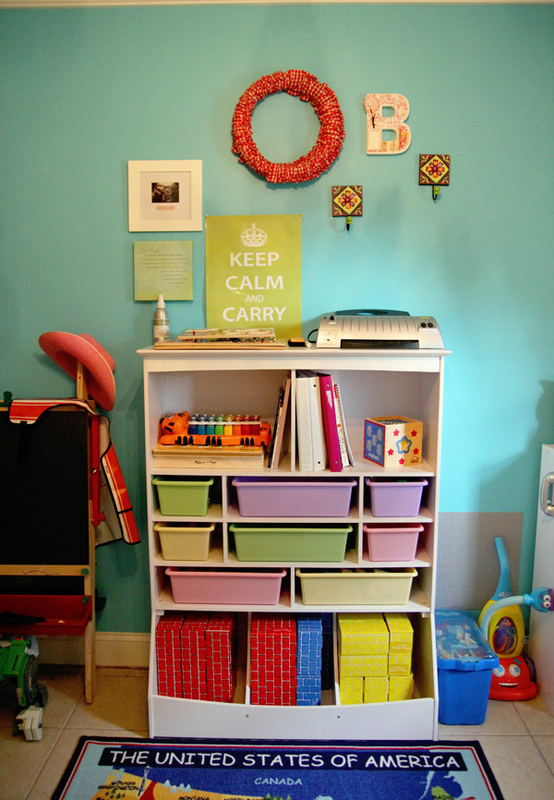 I love how organized and colorful your school room is! This must make learning so much fun! 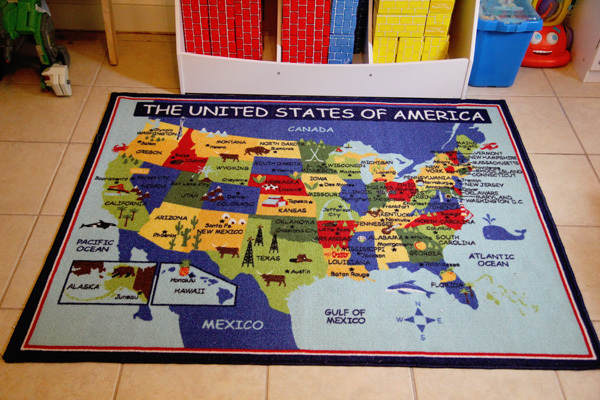 I saw a rug very similar to this at Sam’s Club for $20. Love your ideas. I moved our old, worn out couch to the curb, and replaced it with my kids’ kitchen. Thanks for the ideas! I have cubicles much like that, maybe it’s the same brand but I can’t remember. 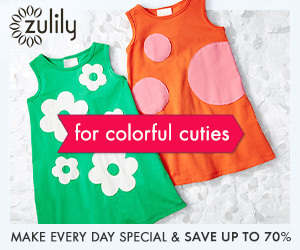 Anyhow, they’re fabulous and I seriously just want to come over and play in that cute room! Very fun and inviting! We have a similar sized house and with 3 kids also, I’ve contemplated many options for bedroom arrangements, etc. (and we just started homeschooling too!) however, with the ages of my kids being fairly spread out, all about 4 1/2 yrs apart, I think the gap may be just too big to accomplish what you have… but we’ll see. 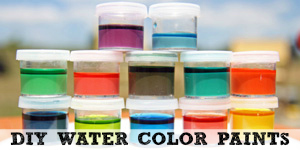 What beautiful colors! Such a pretty yet relaxing room. We need to get some of that shelving, we are using a small corner shelf right now and it is so not working. I love the drawers with the zig zag design! I love love love those cube shelves! I also love the wall color. 🙂 Wonderful job! OMG…. that is an awesome room! Seriously, it is. 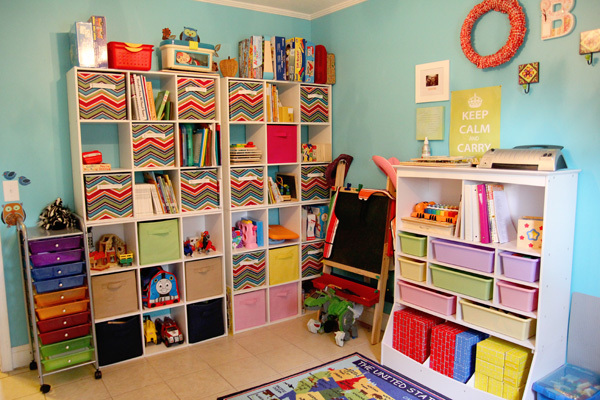 I would love to have a playroom that looks that neat & organized. OH my gosh! I LOVE LOVE this!!! WOW this room is AWESOME, I’m so jealous!! I totally need something like this. 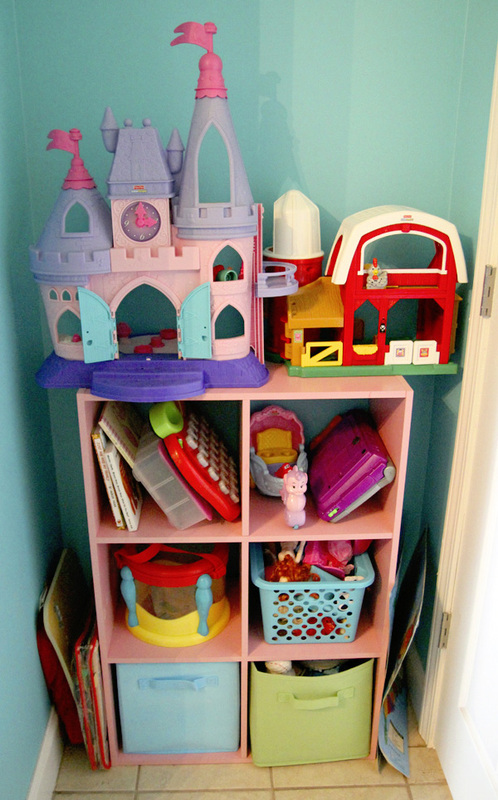 Oh and we have Closetmaid shelves all over our house, I love those things. love love love love! You did an amazing awesome job. I want to go to school in there! Our ‘school room’ is also our guest room with a bed, but to even have this room my older boys have to share a room too. But right now it is totally worth it. Very nice. 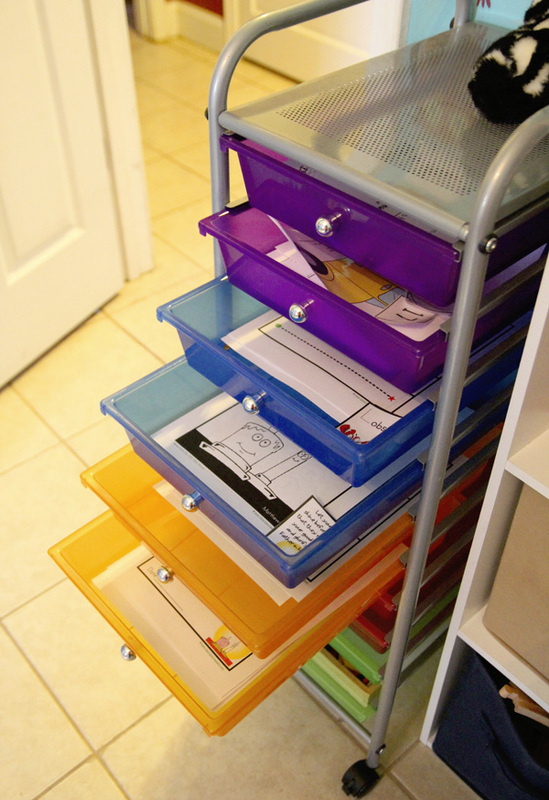 I love to be organized so this appeals to me. Best of luck on the school year! Oh my sweet golly gumdrops! That is the cutest room I have seen in a long time! 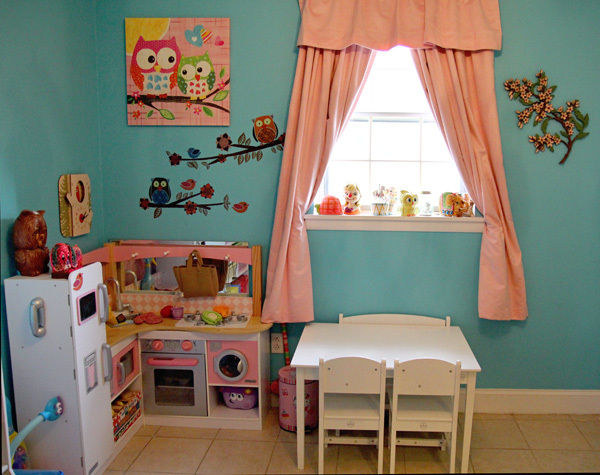 I can even envision myself in that room adapted for sewing or crafting it is so cute! You can come decorate for me any time! 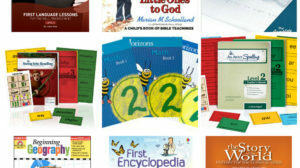 Your play & school your were THE inspiration for the color I chose for my school room. We are having are entire house painted and I just couldn’t decide what to do there. It was a boring beige. Now I it’s Slick Blue by Sherwin Williams. When it’s all put back together, I’ll send you picks. Thank you for inspiring me!!! I like the overall look of the room. I think you did a good job with it. My favorite are those chevron fabric cubes.